I colored up this image last week for the Jingle Belles food or drink challenge and got busy and set it aside. Then the sketch for the new Paper Players challenge came across my feed and I knew it would be perfect for my image! For the Jingles Belles challenge I used this fun gingerbread set from Power Poppy called Frosted Gingerbread. I used my copics to color in the image and although it doesn't show up I used some Wink of Stella in the frosting and snow areas. For the sketch I used some retired SU DSP for my background paper. What a pretty Christmas confection! Traditional but fresh. Thank you for joining us at The Paper Players this week. 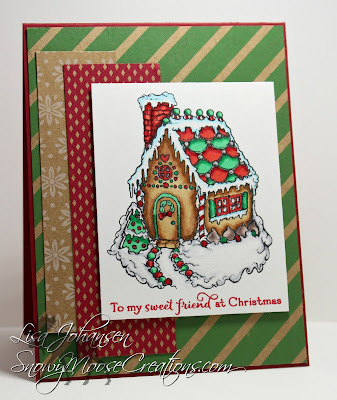 What perfect use of traditional holiday colors ... so very glad you shared your Christmas goodies with us at Jingle Belles. YUM! Lisa, this little gingerbread house is AMAZING! I love the warm country colors and patterns you used too! I can smell the ginger now! 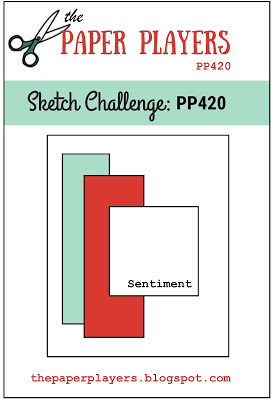 Thanks for playing with our PP sketch this week! Oh my gosh, Lisa! Your gingerbread house is amazing! You have colored it perfectly. Plus, I love your mix of patterns and colors. Thank you for sharing at The Paper Players.